The Everest Base Camp Trek is one of the most iconic trails in the world. With each step taking you higher and higher above the clouds to reach the highest peak on Earth, you can be sure that this hike will boast incredible mountainscape views. What you can’t be sure of, however, is the cost of the trip. While climbing Mount Everest is an item on many adventurers’ bucket lists, a lot of people worry about its affordability. 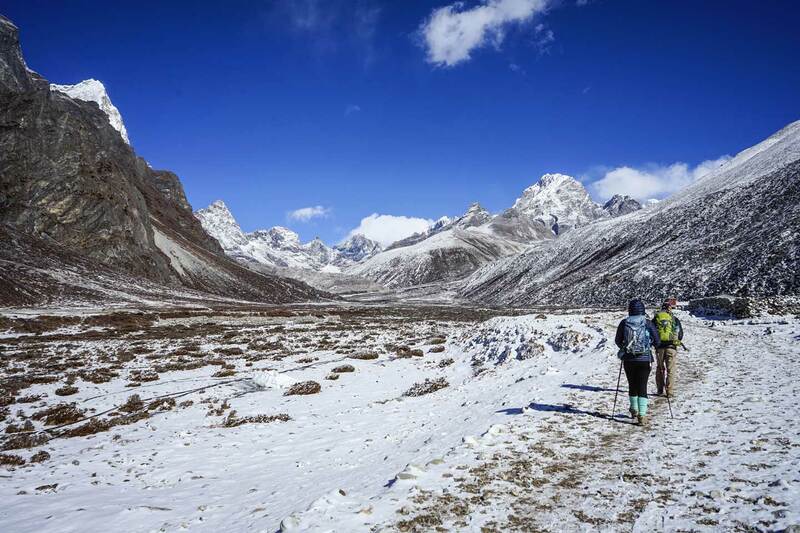 In this article, we have outlined all of the major trek costs, including getting to the region, the actual trek, accommodation, meals, and additional costs such as park permits and tour guides, to help you budget and save so that you can make your Everest dream a reality. 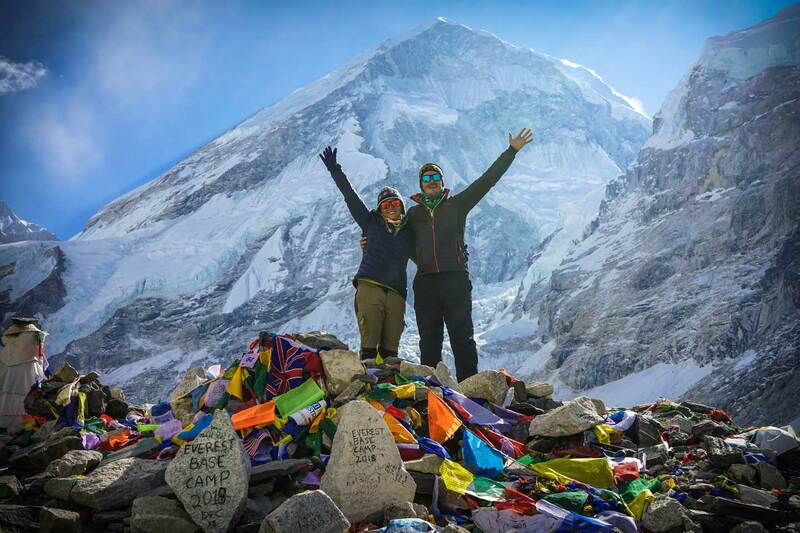 Before we delve into the breakdown of each individual expense of trekking Everest, it is worth giving you a quick overview of the overall cost of the trek whether you are opting to go independently or with a tour operator. Below you can see an estimate of the Everest Base Camp Trek cost as a whole. 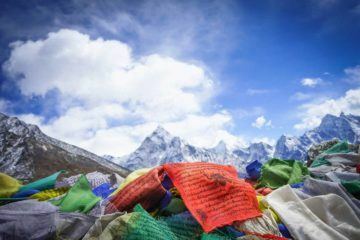 What we recommend: if you want to keep costs down, you can trek Everest independently (you can apparently save around $400-500 if you’re a smart planner), but we highly recommend going with a tour operator. We were coming from Thailand and just closed in on a hectic year so the last thing we wanted to do was worry about all the little details which is why we sought out for professional help. After successfully completing the trek, I’m so glad that we did it this way as the level of support that we got during the trip was amazing. As mentioned, f you opt for a tour operator, all of this is taken care of for you and the trip as a whole becomes a hassle-free experience. When you’re trekking the highest mountain in the world, we think it’s worth trusting the experts to put your safety first. If you’re looking for a reputable tour company that will make your experience, we recommend using our on-the-ground partners, Explore Himalaya. 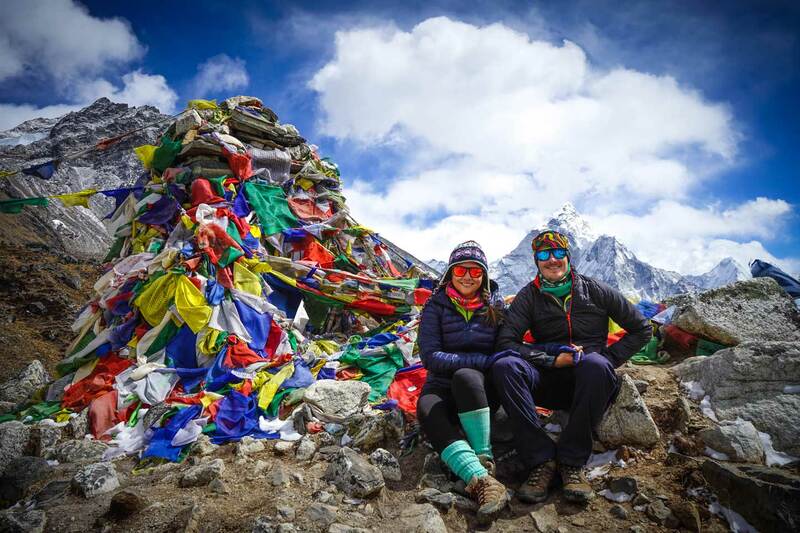 You can see how amazing our experience was with them in our Everest trek review here! If you’re opting for doing the trek with a tour operator, this will be your biggest expense of the whole trip. If you do your research, you will find that there will be local tour operators who offer the trek for as little as $700 and there will be bigger companies who charge within the region of $1,000 to $2,000. We recommend paying in the middle of this range, $1,300 to $1,600, as this will ensure that you have a high-quality service and a safe experience with most expenses included. As we said previously, it can be tempting to cut this cost altogether but let us see what is included in this price first. As you arrive at Kathmandu airport, your tour operator will meet you in arrivals and will take you to your private hotel accommodation before your trek begins. In fact, they even provided us with a local tour around Kathmandu when we arrived. Personally, we absolutely think that this is worth it as it allowed us to have a smooth, relaxing and enjoyable trek without any hassle or worry. Please note: visas, food, and any other spontaneous buys on the trek are not included in your trek price. Editor’s Note: Get a Discounted Rate with Explore Himalaya if you mention you are our reader! Another expense to consider during your Everest Base Camp Trek will be flights. 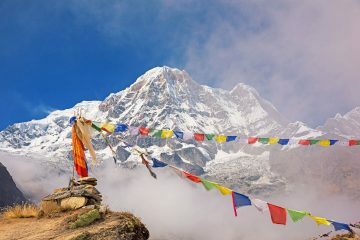 Obviously, the price will change considerably depending on where you are departing from (typically European flights are cheaper than North America for example) but generally, reaching the remote nation of Nepal often requires two flights. Most flight paths involve flying into the Middle East, China or India first and then taking a second flight directly to Kathmandu Airport. Price can also change drastically depending on when you are traveling, e.g the peak season compared to the offseason, but you should expect to pay somewhere between $500 and $1,000 for your flights. For the sake of this trek breakdown, we will only be listing the local flights. 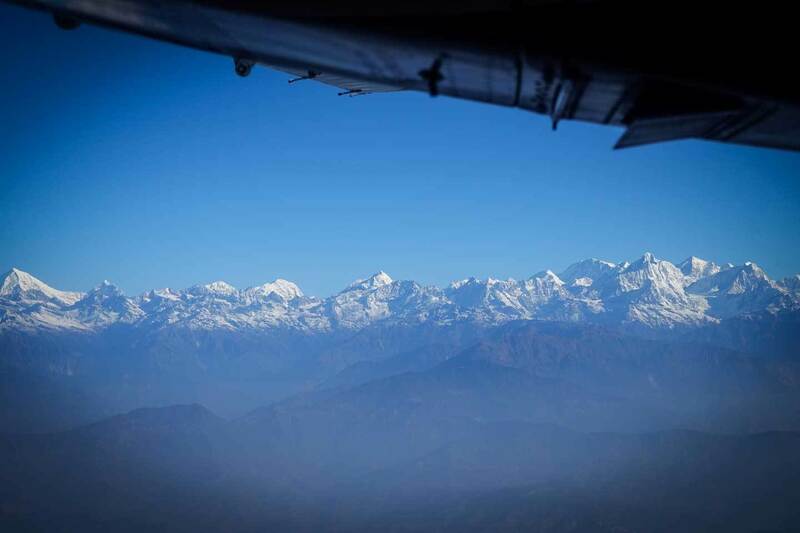 Once in Kathmandu, you will then need to take a domestic flight to Lukla Airport, also known as Tenzing-Hillary Airport, which will cost approximately $335 – $400 the latter including the cost of your guide- unless you hire them from Lukla itself. The logistics of this flight and your transfer are included in your trek cost with a tour operator, but if you are organizing your trip independently, you will need to arrange the flight, the airport transfer, and your accommodation. Money-saving tips: always book flights as early in advance as possible and if you can, try to book them outside of the peak seasons (Feb-May and Sept-Nov). If you’re organizing your trek by yourself, you can save on the internal flight cost by taking a bus or taxi to Jiri for $10 and then starting your trek to Everest Base Camp from there. This may save you some dosh but it does involve a 6-8 hour bus ride rather than a 30-minute flight and it also lengthens your trek by about 4 days. We recommend purchasing a 1-month visa just to be safe! As most Everest treks are around 14 days long, the 1-month visa covers you for any unplanned delays, such as flight cancellations etc. 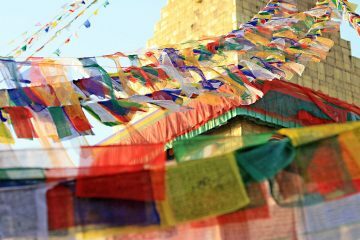 If you also want to explore other areas of Nepal such as Pokhara and the other mountain ranges, this visa makes it possible. Once in Nepal, you will then need to purchase two permits to be able to complete the Everest trek: the Trekkers Information Management System (TIMS card) and the Sagarmatha National Park Entry Permit. The TIMS card costs around $19 and is necessary to register your information into a database in case of any emergencies while the National Park Entry Permit will cost around $32. Again, these costs are included in your tour operator price and will be arranged and purchased for you. If you’re trekking independently, these permits have to be secured beforehand in Kathmandu. Although not the biggest expense, travel insurance is by far the most essential purchase you will make when organizing your Everest trek so make sure that you do this in advance! 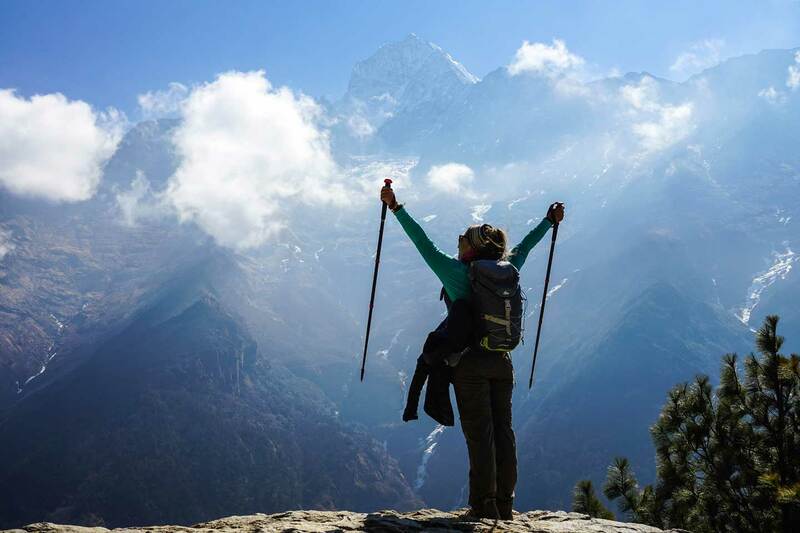 Personal travel insurance is not covered in your tour operator price, so regardless of how you are trekking Everest, insurance is on you to sort out. One of the biggest pieces of advice that we can give you when purchasing your travel insurance is to make sure that your policy includes high altitude coverage. This is so important as so many people had to be evacuated from Everest via helicopters but yet so many policies don’t cover anything that happens over a certain altitude! As you can imagine, this evacuation will not be cheap. To make sure that you get a policy that covers both basic events like canceled flights and lost baggage AND medical expenses and emergency evacuations that occur up to 6,000m, we recommend getting a quote from trustworthy providers such as World Nomads. These guys gave us so much peace of mind while we were trekking and watching the daily helicopter evacuations, and a 30-day insurance policy only costs around $150. 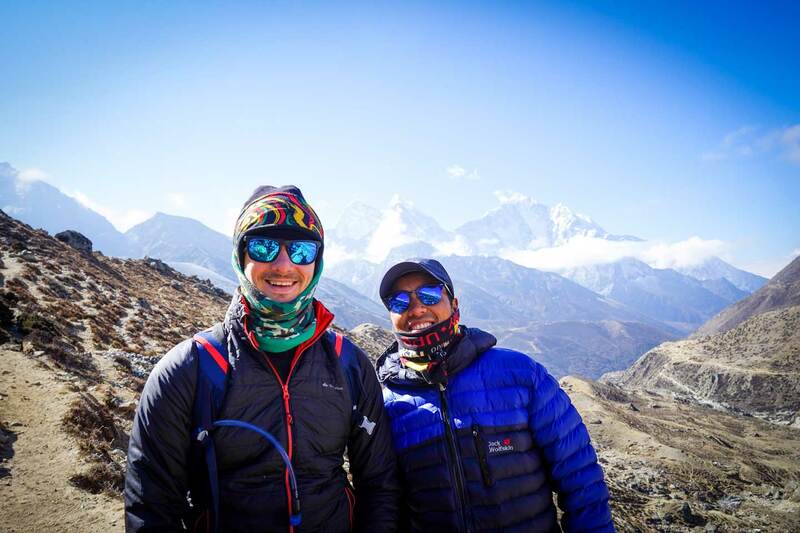 There are some pieces of equipment that are essential for trekking Everest, such as a high-quality Winter sleeping bag, thermal clothing, hiking boots, trekking poles, a warm waterproof jacket, hat, gloves, sunglasses etc, but then there are some items that might make the trek more comfortable but they are not necessarily needed. Take a look at our full Everest Base Camp Trek Packing List to get an idea on what you need to bring. 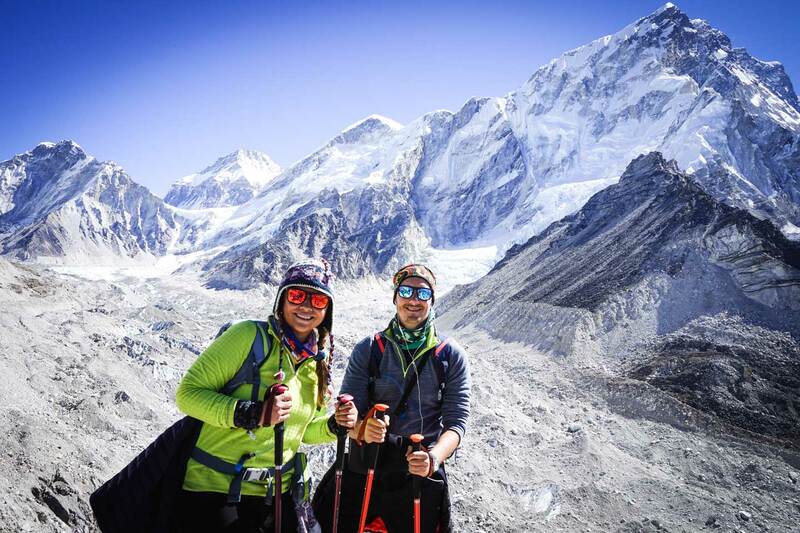 If you look at a full list of all the equipment that is needed for trekking Everest, you will be pleased to see that you own some or most of the equipment already, so this will save you a few hundred dollars. We recommend using good quality worn-in hiking boots and comfortable clothing that you know will keep you warm as nothing is worse than buying new equipment and finding out that it doesn’t hold up to the test when you’re thousands of feet in the air. There is nothing worse than getting blisters or being cold on day 1 or 2 of the trek, so make sure you have trusty equipment to take even if you have to test it out beforehand. 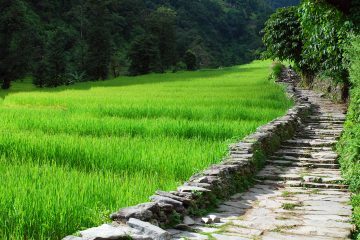 In Kathmandu, you can rent or purchase almost everything that you will need during the trek. We didn’t want to buy sleeping bags only to be used once so we opted to rent this. Insider Tip: Hiking gear is sold all over Kathmandu, especially in the center. One of the most popular shops for gear rental in Kalapathar Trekking Store. Although it is hard to find sizes and the clothes are all jumbled up, the prices are super cheap and affordable. P.S. Walking sticks are god-send for your knees! 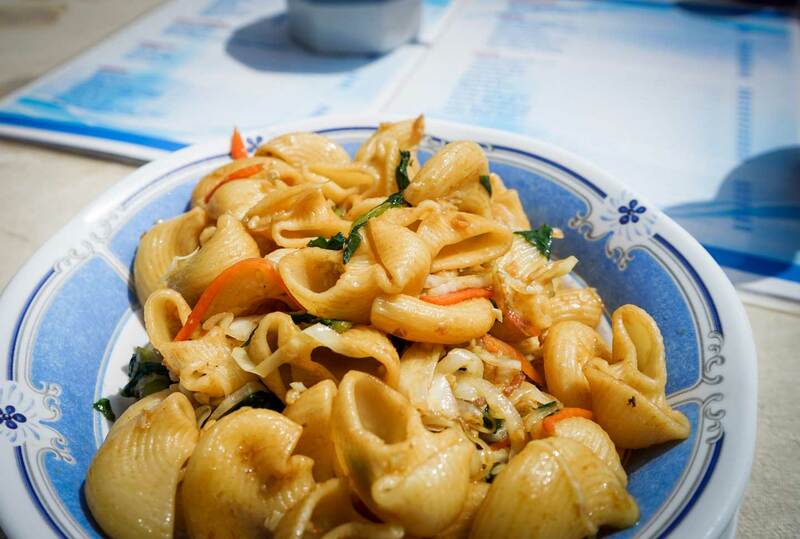 The food is mostly carb-heavy dishes to refuel your energy for a full day’s trekking. You can expect to see a lot of momos (dumplings), potatoes, pasta, sandwiches, dal baht (lentil soup, rice and vegetables), and even desserts such as apple pie and cheesecake. On average, we spent around $20 a day for food and drinks and around $5 a day for snacks (tea, chocolates, cake, etc.) For a 12-day trek, this would cost around $360. Please note: regardless of whether you’re trekking with a tour operator or independently, food and drinks are not included in the Everest Base Camp Trek cost. 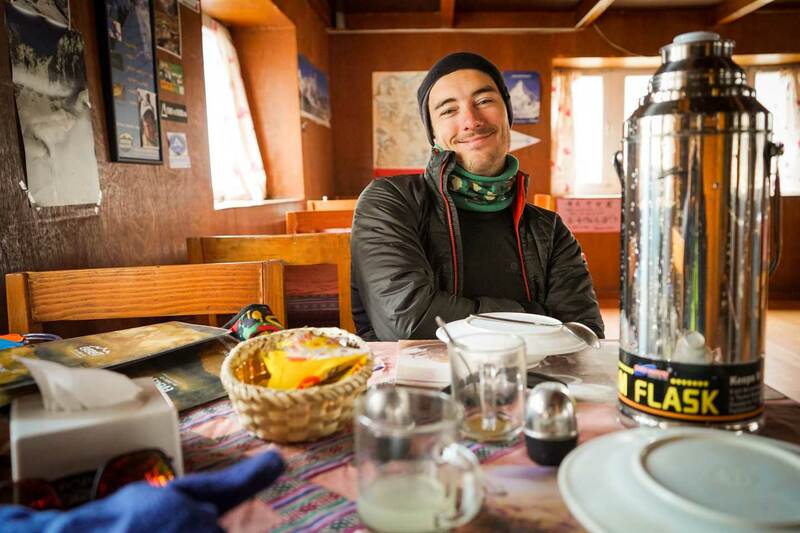 If you’re trekking independently, some tea houses will let you stay for free, as long as you have all meals with them. Places like Namche Bazaar had more options in terms of restaurants and coffee shops so passing through while going up and down is always a treat. Although you had a lot of variety, the food starts tasting the same so be prepared for this. Insider Tip: We decided to go vegetarian during the trek as the last thing that we wanted was an upset stomach. A lot of people do this as storing meat as you get higher up in the tea houses is questionable so better safe than sorry! Vegetarian dishes are also a lot cheaper which is great for those on a budget. We also didn’t drink during the entire trek which saved us a lot of money. Tom did go for a celebratory drink on our way back down when we got to Namche Bazaar. If you’re trekking Everest independently, you will have to organize and pay for your accommodation yourself. 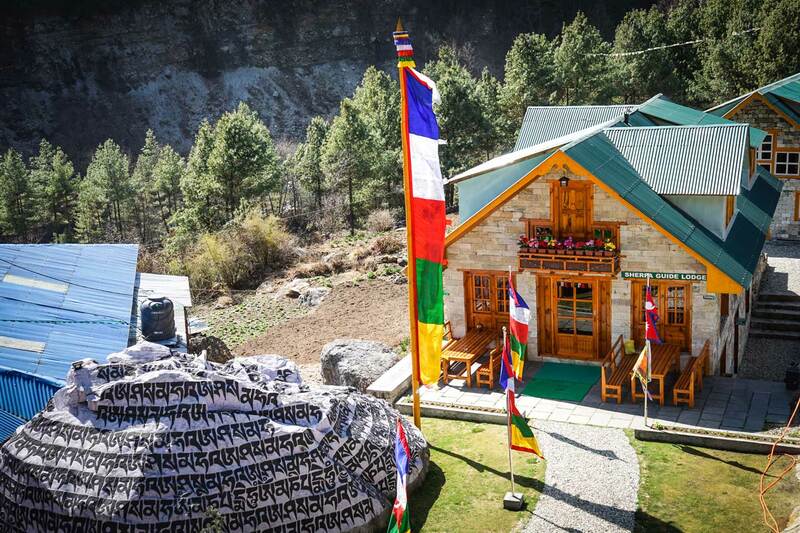 Although the actual accommodation price is peanuts (the average cost per night for a bed in a teahouse is less than $1 per person or $2 for a room with two beds) it is the hassle that comes along with the planning and booking of the accommodation all along your trekking route that you’re avoiding when you pay to go with a tour operator. Teahouse rooms are extremely basic with a bed or beds and a few hooks to hang your clothes. If you’re lucky, you may have a nightstand, but all toilets will be outside of your room. We stayed at the Everest Inn in Namche Bazaar and lucked out as our room had its own toilet inside. Although cheap on the actual trek, it is the accommodation in Kathmandu before and after the trek that will make up the largest portion of your budget. Please note: most teahouses have the caveat that you must eat at the attached restaurant otherwise accommodation is an additional $10. Tipping guides and tour staff is also customary in Nepal as guides often spend weeks away from their families to help you navigate the mountain safely. Although the amount you tip is entirely at your discretion, we recommend approximately $15 per day per group for a guide and $8 for a porter. Hiring a local porter and guide is also a great way to support the local economy and provides them with stable jobs. Our guide has been working for the same company, Explore Himalaya since he was young and has worked his way up from porter to guide as his English improved over the years. For a full 14-day Everest Base Camp Trek, the overall cost of the trek can be anything from $1300-1700, excluding International flights. Our trip with Explore Himalaya cost us around $1200 per person plus the cost of food which averaged to be around $200 each and our tips to the porters and guides. All in all, we probably spent around $1400 per person. The numbers above are based on a high average, without scrimping on any costs. I’ve heard of some people who really stuck to a budget and managed to do it independently on $700/person so the budget depends largely on your travel style and how tight your budget is. I personally got really sick during the EBC trek and having a guide there really made a huge difference for me. Not only did we have to worry about which tea house we were going to stay at from place to place but we also had someone experienced to help me navigate the beginning signs of altitude sickness. We saw some independent trekkers who were being turned away from the teahouses as there wasn’t enough room which meant they had to walk to the next town. As mentioned, when we were there, we saw people getting evacuated on a daily basis. Our guide from Explore Himalaya was in touch with their main office in Kathmandu who in return, was keeping tabs on my symptoms, ready to call for help and advice on how to proceed. This gave me a lot of peace of mind as the last thing on my mind during the trek was having to worry about logistics if my health continued to go south! During our trip, Explore Himalaya provided us with a water filter system which we could use. It was only during the last two days that they advised that we purchase water as their water system couldn’t clean the water 100%, leaving a strong aftertaste. When you’re trekking, especially in high altitudes, you need to drink tons of water. In fact, I was aiming to do anywhere from 4L-5L per day. As you can imagine, the cost of water piles up if you don’t have a sterilizer. Plus, it’s not great for the environment to keep purchasing water bottles so having one with you is actually essential. 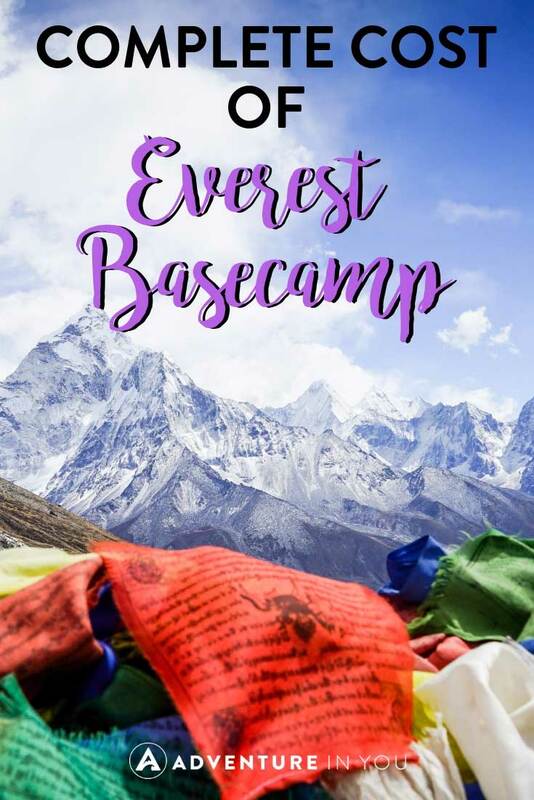 Hopefully, this guide will help you work out and budget for your Everest Base Camp Trek cost whether you are trekking with a tour operator or independently. Now, all that is left to do is to plan, save, and book to tick off another adventure on your bucket list!